Updating web services on ArcGIS Online using ArcPy? Would anyone be willing to look at this code and see if they can find out where I've gone wrong? I think I see the error in your image. (this is why copy/pasting code is better than the image). From your error screen shot, its failing on the CreateWebLayerSDDraft call. After FEATURE_ACCESS, make sure that you have a double quote "" (its hard to tell if its a single quote. Single quote is bad). The very last True, you have a " (quote) after it. Remove that. Not the answer you're looking for? Browse other questions tagged python arcgis-online arcgis-pro web-service update or ask your own question. Cannot Publish from ArcMap to ArcGIS Online? How to republish Hosted Feature Layers on ArcGIS Online without losing the data? 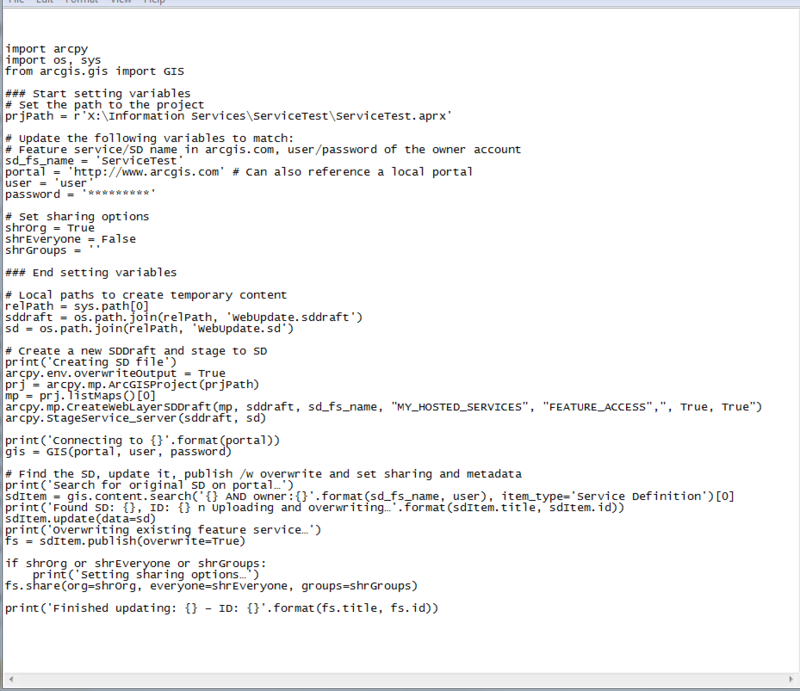 Using the arcpy Python library with hosted feature service layers from ArcGIS Online? How to update a hosted feature service on ArcGIS Online using the Python API for ArcGIS Pro?